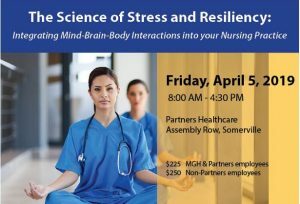 The Benson-Henry Institute for Mind Body Medicine (BHI) is inviting nurses and healthcare clinicians to its upcoming continuing medical education program, The Science of Stress and Resiliency: Integrating Mind-Brain-Body Interactions into your Nursing Practice. The program is offered under the auspices of the Norman Knight Nursing Center for Clinical & Professional Development at Massachusetts General Hospital. Venue: Partners Healthcare at Assembly Row, Somerville, MA. CME: Participants will earn 7.5 contact hours. Daily exposure to stress and shift work are two common features of nursing practice that, if left unchecked, compromise health and increase vulnerability to provider burnout. Through advances in technology and bioscience, greater understanding of the body’s regulatory systems is now understood to involve mind-brain-body interactions and circadian rhythms that are modified by lifestyle behaviors. Learning how to modify behavior in support of these key regulatory systems increases health and resiliency. Conversely, lack of knowledge and failure to adhere to these behaviors disrupts key regulatory pathways, resulting in greater vulnerability to specific diseases and symptomatology. This course an excellent opportunity for nurses to learn how both stress and circadian systems affect the brain and body and to develop self-care skills they can teach patients and utilize themselves. Participants will hear the latest research into the science of stress and how it affects the body at the genomic level, understand how lifestyle behaviors and the timing of these behaviors can positively impact health outcomes and build resiliency, build skills in meditation, stand cognitive reappraisal and take part in mind body practices like yoga. 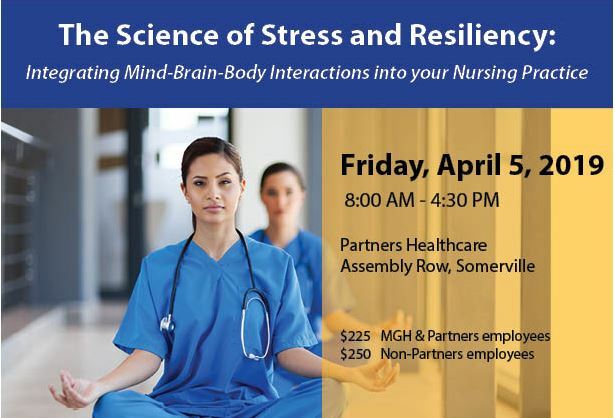 Speakers include BHI’s Clinical Director of Training, Peg Baim, MS, ANP; BHI’s Director of Research, John W. Denninger, MD, PhD; Laura Malloy, LICSW, RYT, Director of Yoga Programs at BHI; Katherine Rosa, PhD, FNP, Co-Director of the BHI Stress Management and Resiliency Training (SMART) program; and Boston-area nursing leaders Patricia Martin Arcari, PhD, RN, AHN-BC, Program Manager for Meditation and Mindfulness at the Zakim Center at Dana Farber Cancer Institute and Joanne Rowley, RN, MS, HNB-BC, Clinical Nurse Specialist and Holistic Nurse at MGH Revere. For more information or to register, visit http://ow.ly/jUvf30nKNO0 or email [email protected]. Norman Knight Nursing Center for Clinical & Professional Development at Massachusetts General Hospital is an approved provider by the Ohio Nurses Association an accredited approver of continuing nursing education by the American Nurses Credentialing Center’s Commission on Accreditation. (OBN-001-91). Criteria for successful completion include: electronic check-in or paper sign-in at the beginning of the program, attendance at the entire event and submission of a completed evaluation.